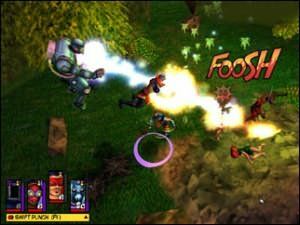 Irrational Games made a huge name for themselves with the enormously successful System Shock 2. 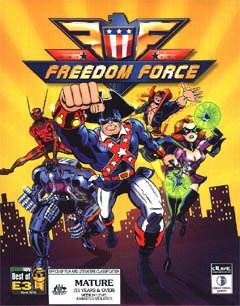 Since then, they�ve produced a couple of other fairly successful titles, but Freedom Force is a definite return to the brilliance that is possible from this development house. Rather than stick to one of the traditional genres (First Person Shooter, RTS, Adventure, etc), Irrational have produced a game that breaks the mould but does it in a way that works with the particular subject matter extremely well. The best and quickest way to describe Freedom Force is a RTA (or Real Time Action). You start with one superhero, Minute Man, but can end up with a team of super crime fighters to take on the later missions. You control them in a similar way to the methods used in RTS games � left click a location to move there, left click on a person or object to interact with them, right click to bring up a context menu of commands. You can zoom in and out (which actually changes the angle to a more appropriate one depending on the current zoom height). Yes, we are talking superheroes. And the game is very much based on the silver age comics where superheroes were powerful, and comics were full of �KAPOW� and �ZAP�. Each crimefighter had their own secret past of how they ended up doing what they do, and their own superpowers. And most importantly, it�s the age old struggle between pure good and evil. The levels are full of comic style captions and characters. The voiceover reading out the captions is just how you�d imagine those old style comics would be like if they were audio-based. 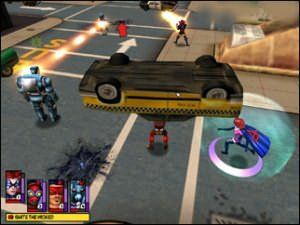 And we just loved the way the bad guys and �mysterious stranger� kept being featured throughout the game (just like a comic would switch to scenes where the main character would not be involved). The storyline is excellent and draws you in convincingly, especially if you were a comic book lover in your younger days. This is one game that will appeal to the older gamer as much (if not more so) as the younger crowd. Graphically, the game is extremely impressive. Since the style of the game is semi top-down, semi isometric in 3D, Irrational has been able to design an engine that is capable of running in high resolutions without the typical slowdown on most gamers� PCs. We did experience some slight graphical flaws on one of the PCs we tested the game on, but these were not present on the other machines. The single player campaign is a little on the short side, but multiplayer is the logical next step once you�ve proven yourself against the crims that have arrayed themselves in opposition to Minute Man and crew. Once you get to multiplayer, you begin to realise where the depth is in this title. Late last year, the developers released a skin editor so that fans could prepare themselves for the inevitable release. This turned out to be a very good move, because by the time Freedom Force was released, there was a huge array of superheroes ready to go head to head. We recommend this title highly, for a number of reasons. It�s by Australians. It�s got some new concepts. It�s been executed very professionally. It brings the glory days of comic book super heroes back into the limelight. It�s got a huge amount of potential for mods and new superheroes. Us Aussies have reason to be proud of Irrational Games, as they�re an Australian developer based in Canberra . Since they�re �one of us�, we here at ImpulseGamer thought it an excellent opportunity to probe the mind of a game designer. So, we tracked down Jonathan Chey and asked him some of those questions that we�ve often wondered about. [IG] Let�s start with an easy one. Why did you pick a superhero game? [JC] Several reasons: it's fun, it's an underexploited genre as far as games go and it provides a good opportunity to create some new gameplay experiences. [IG] When designing Freedom Force, what was your inspiration? Was there a particular band of superheroes that really drove the concepts? [JC] I think the inspiration was comics in general, particularly the "silver age" comics but not any one specific team or storyline. We're trying to recreate the look and feel of the age. [IG] Games are tough to do well, but what was the most difficult bit to get right? [JC] The technology needed to pull off the interactive environment. 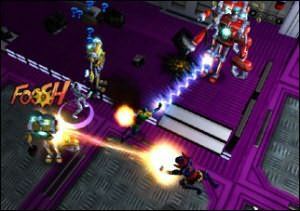 The physics system and the game systems underlying the combat and movement were very complicated. We worked on these systems for a long time before we got them right. [IG] Was there anything in Freedom Force that exceeded your expectations? [JC] The whole game has honestly exceeded my expectations. I knew we had a good idea but you can never be sure that you are really going to be able to pull it off. I'm also quite amazed by the reaction of the community to the game and the character tools that we released beforehand. The number and quality of skins available online is astounding (check out the skins at www.freedomforcecenter.com for example). [IG] What is the aspect of the game you're most proud of? [JC] I think I'm personally most proud of the character and power creation system because it gives people a lot of scope to create their own characters the way they want them. It's something that hasn't been pushed to this level in a game before that I am aware of. [IG] What do you hope the gaming community is going to get out of it? [JC] I hope that they will get the superhero gaming experience that many have been waiting for. I hope that they will enjoy the complex simulation-based tactical gameplay that we worked hard to get right. And I hope that they appreciate and learn to like the characters and story we have created. [IG] Do you personally have a favourite character? [JC] Has to be the Alchemiss. I'm a sucker for those Southern accents and she's got some cool powers too! [IG] Have you heard of any way out models created in the model creator you guys released last year? [JC] I think we're yet to see the limits of what you can do with custom models. We're looking into some more way out ideas here ourselves to be released soon.